The cool, lively sparkle of aquamarine seems even more refreshing when it's placed in a contemporary setting, and this modern solitaire aquamarine solitaire ring is a striking example. 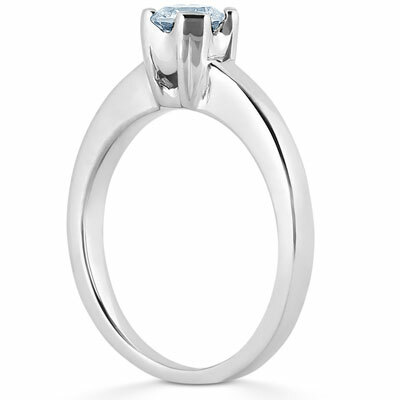 This 14K white gold piece places a round 6.5mm aquamarine in a subtly updated setting of four pairs of shining prongs, creating a look with a little something different that's always fresh and always welcome. A 14K white gold band is the foundation for this chic solitaire style, adding cool, complementary shine. This modern 14K White Gold Setting enhances the beautiful crystal blue of a 6.5mm aquamarine for a beautiful yet classic look. 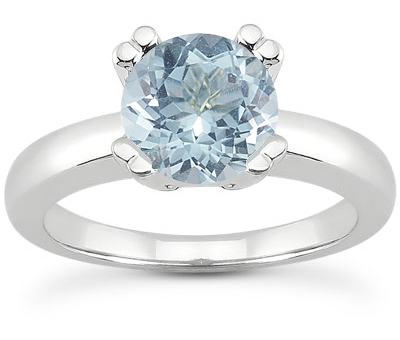 We guarantee our Modern Solitaire Aquamarine Solitaire Ring to be high quality, authentic jewelry, as described above.